Your company's productivity - and, ultimately, its profitability - depends on making sure everyone performs to their fullest potential. The need to effectively leverage the skills of employees is even more critical for small and mid-sized companies in order to successfully compete in the marketplace. When an organization effectively sets and closely ties individual employee goals to the company's overall strategy, there is a dramatic increase in both employee performance and business financial results. Increasing operating margins by using SMART goals to clarify expectations and accountabilities. Allowing quicker execution of strategy by more effectively and efficiently allocating resources and eliminating redundant responsibilities. Reducing employee turnover and increasing employee satisfaction and engagement by creating greater employee ownership of goals. However, to be effective, goals must serve the needs of both the company and employees. For the company, goals must contribute directly to short-and long-term business strategies. For employees, goals must be clear, objective, understandable and achievable. Your managers also need the tools that can help them communicate and align goals across the organization with greater clarity and efficiency. Today, small and mid-sized businesses are increasingly using automated systemsto increase productivity and improve their bottom line. 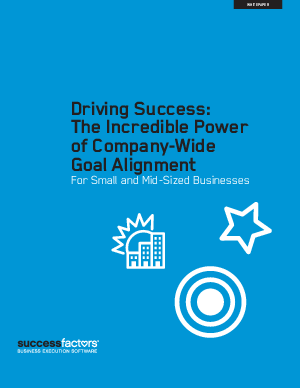 Learn how to put the incredible power of goal alignment to work at your organization by downloading this whitepaper.